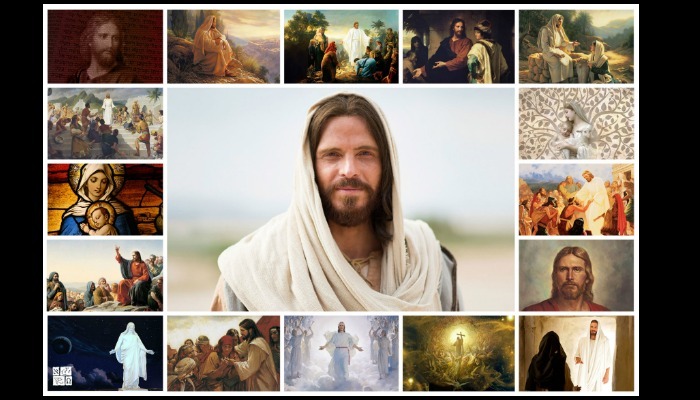 Greg Olsen, Walter Rane, and Del Parson are some of the favorite artists among members of The Church of Jesus Christ of Latter-day Saints. Their images have been featured in our lessons and hung on the walls of our homes for years. These artists and their work have touched our hearts and lightened our minds. 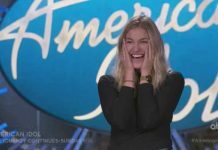 Now, there are new rising artists who have brought more light and joy to our lives through their skills and talents, just as beautifully created as those that came before them. So let’s check them out and see their unique pieces and depictions of Christ! Working primarily in mixed media of oils, acrylics, charcoal pencil, and gesso texturing, Henrie has risen quickly as a favorite new artist with her work featured in Deseret Book stores, Bronze Coast Gallery in Cannon Beach, Oregon, and Authentique Gallery in St. George, Utah. She recently published her first book entitled Visions of Hope: An Illustrated Portrayal of God’s Plan for Us. 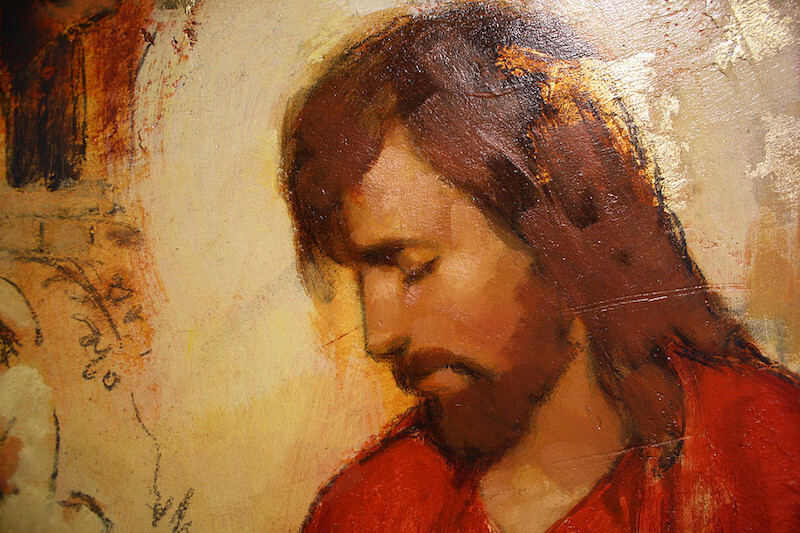 The untitled work below features Christ tenderly rendered through beautifully long and soft brush strokes. Rast has also quickly grown in her fame. 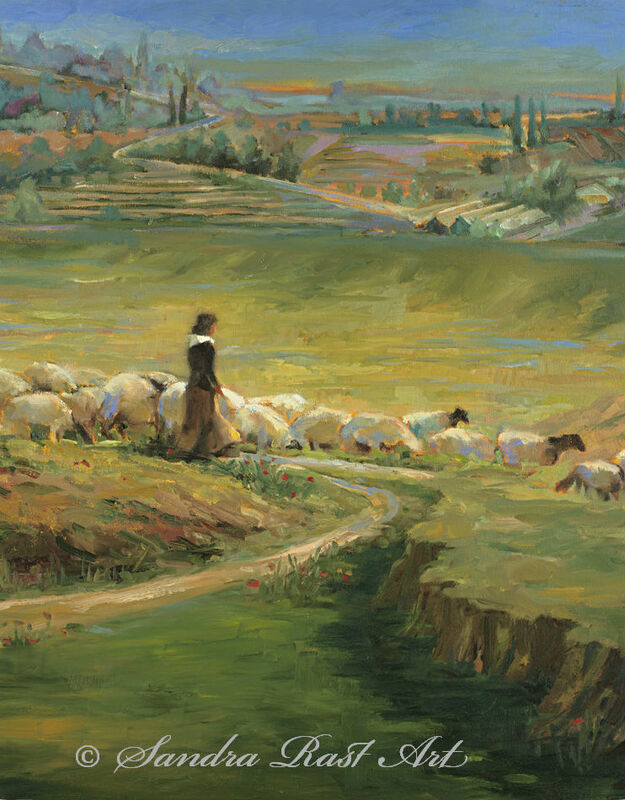 Her painting “In the Garden” is featured on the cover of the book called “My Dear Sisters,” published by Deseret Book and several other of her pioneer paintings are featured on the Joseph Smith Papers. This painting, titled “Hills of Bethlehem” depicts the Savior caring for His flock. Although He isn’t super defined, the lack of sharpness in the work makes it almost seem as if it were an old memory. As a professional photographer for the past fourteen years, Sumner’s work can be found from Nauvoo, Illinois, to Stockholm, Sweden, and from Italy to Australia. He is a founding board member of the Inspirational Art Association (IAA), has served as President of their Board of Directors, and currently serves on their advisory board. 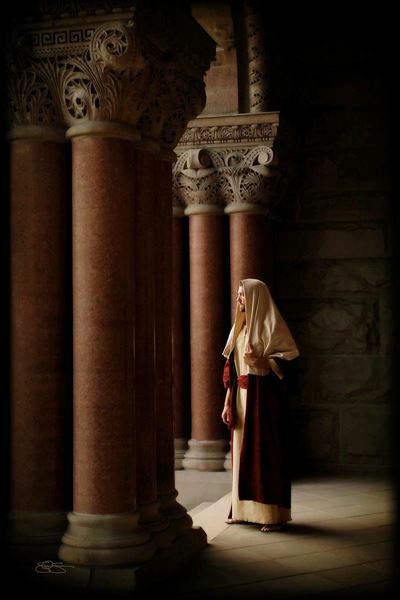 This photo, entitled “Lord of Hosts” is quick to draw attention to the Savior as its focal point. The light and dark contrast beautifully create symbolic meaning. Painting in Sacramento, California, Close’s works are represented in both public and private collections including The Museum of Church History and Art, Southern Virginia University and Vision Services Plan in Sacramento. 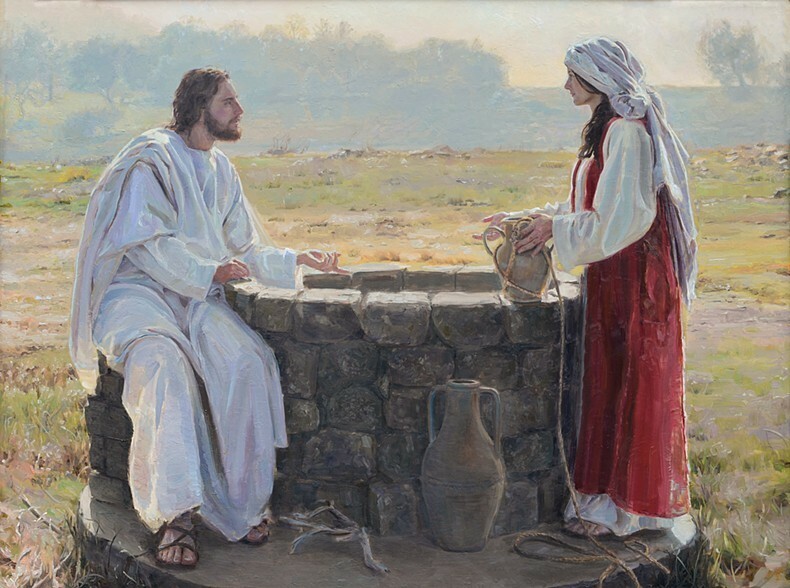 This painting, entitled “Woman at the Well,” is a new depiction of this well-loved story. As the woman bears the red robe, often seen in paintings of Christ, we see deeper into the story and what Christ truly sacrificed in taking upon Himself our sorrows, pains, and sins. 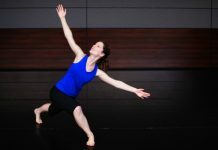 Only beginning her art career in her second year of college, Meads has gone on to teach drawing and painting at several locations including Brigham Young University and the Bountiful/Davis Art Center in Bountiful, UT. Her sketches have a raw beauty. 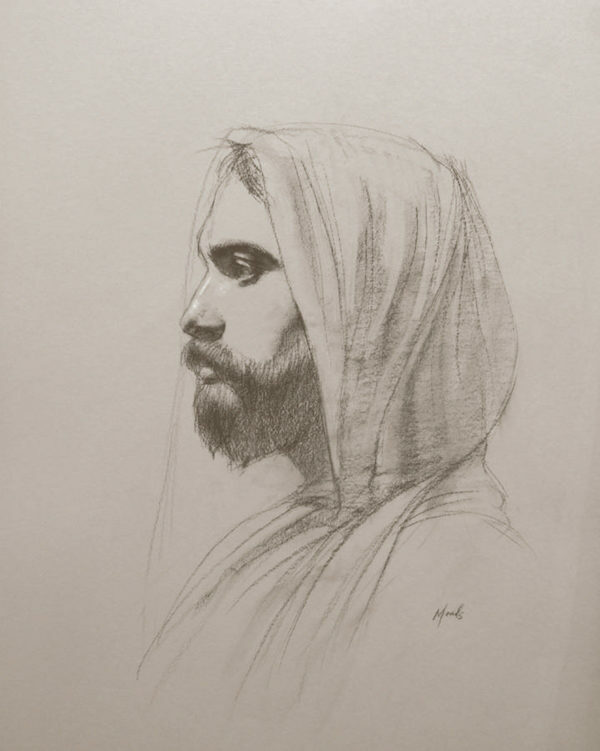 This sketch, titled “The Prince of Peace” features a calm Christ who might be found walking through the streets of Jerusalem or pondering on the things of eternity. Peterson’s Mormon pioneer heritage combined with her life-long international travels have influenced and inspired her unique and narrative style. In addition to painting, she welcomes any opportunity to create beauty with her hands and loves making batiks, stained-glass murals, intaglio prints and building clay figures. 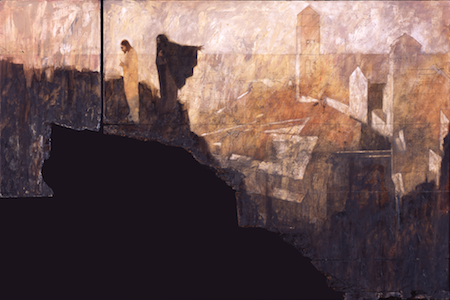 This work, titled “Sand Script” depicts the story of the woman taken in adultery and has a unique set up that presents one of the more modern stylized images of Christ. Born in Concepción del Uruguay in Entre Ríos, Argentina, Santangelo has been an artist since the age of 9. He has won numerous awards and is featured in many museums across the world. This particular work, titled “El Llamado,” features a similar style to Pablo Picasso’s called Cubism and shows Santangelo’s talent in bringing to life the story of Christ’s original call to the apostles. After graduating from BYU in 2009 with a BFA in Painting and Drawing, Connolly has been passionately pursuing a career in art. 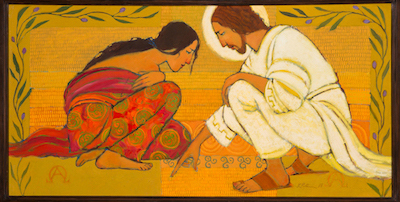 Her artwork is featured in the Conference Center on Temple Square and can be found at Deseret Book. In Connolly’s work, titled “A Believing Woman” we see the Savior tall and strong, yet still gracefully and lovingly looking upon the woman. 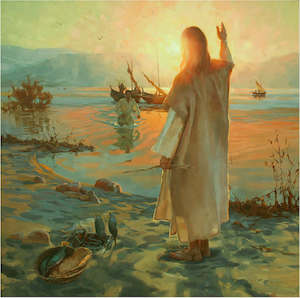 Focusing on contemporary spiritual art, Richards has studied under many famous LDS artists. His two years spent studying in Rome have also had great influence on his coloring and style. 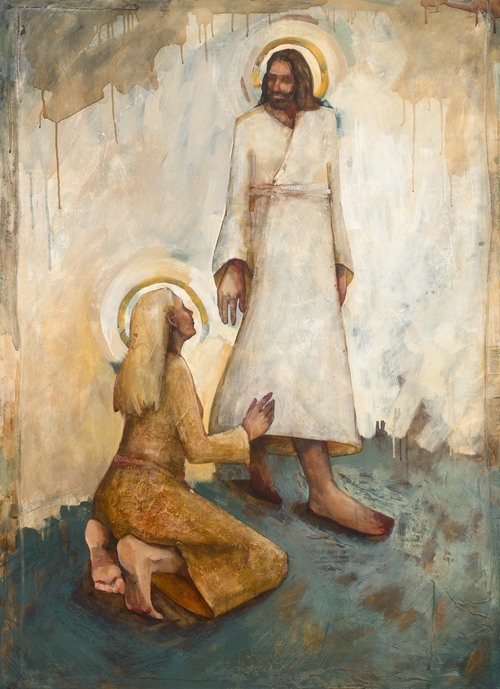 His painting titled “The Temptation” captivates the eye and draws us to feel the Savior’s struggle through His forty-day fast. Koch’s art can be found in LDS Temples, the Utah State Capitol, the LDS Church Art Museum Collection, and in many corporate and private collections. He seeks to constantly improve his art and he loves to fill his art with layers of symbolic meaning. 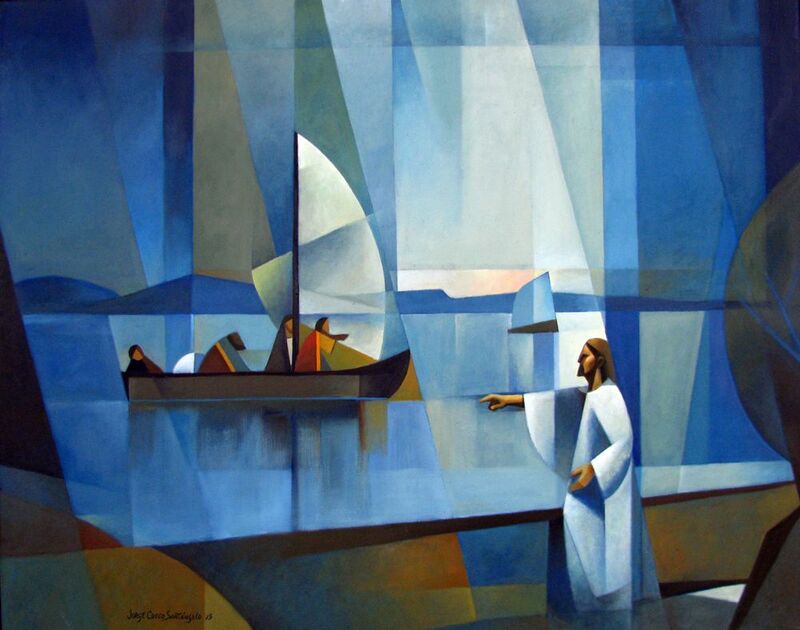 This work titled “Fishers of Men” shows the Savior after His resurrection calling out to His disciples. Although we can’t see the face of Him or Peter, we can see so much through the light, posture, and angle portrayed. There are so many more new and rising artists out there with so many different styles. Their talents and gifts can help us to fill our homes and our lives with Christ’s influence. Through images, scriptures and other ways we can work to more fully center our lives on Him and to become like Him. Do you have a favorite artist or work? Please share! Kayla is a member of the Church of Jesus Christ of Latter-day Saints. She is currently an Intern at MormonHub. She studies Journalism and Spanish literature at Utah Valley University. She laughs her way through life and finds beauty in the small things.